3M Diamond Grade 983RR Rail Car Conspicuity Tape - Similar to standard 3M® 983 Diamond Grade reflective tape, 983 RR reflective tape is approved by the Federal Railway Administration (FRA) for use on rail cars and locomotives. It carries the FRA stamp (enlarge images below). FRA regulations require it be applied to all railcars by May of 2015. It is intended to enhance the visibility of railroad cars and locomotives in darkness at railway crossings (see specifications). It utilizes micro-prismatic lenses encased in a clear resin to reflect light and has an aggressive tack adhesive to enable it to stick to a variety of surfaces. 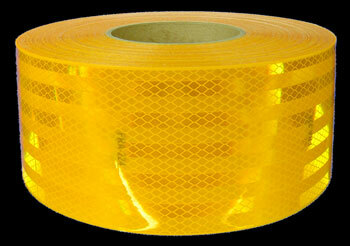 These rolls are kiss-cut into standard 18" application lengths (100 per 50-yd roll). Applied properly, this extremely tough, durable tape is edge-sealed is warranted by 3M for a life of ten years in outdoor conditions. 3M 983 railcar conspicuity tape can also be applied to industrial equipment, bollards and any other items where night time visibility is a important. 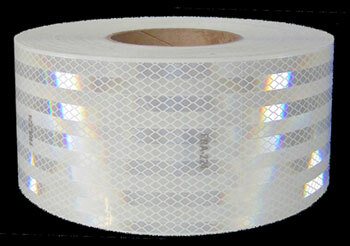 FRA tape is stiff, but flexible enough to wrap around diameters as small as 4-inches.